Ace Marketing Solutions are delighted to announce that we are offering a 14-Day Free Trial for those looking to try out our full hotel management system. Currently 30+ hotels and guest houses in Chiang Mai, Pattaya and elsewhere in Thailand are using this cloud based all in one hotel solution. Is the System Trial Suitable for Hotels and Guest Houses Outside of Thailand? If we haven’t listed your country, that doesn’t mean we can’t support your hotel or guest house. Get in contact and we can see if we have the resources to fully support your time zone/ language. How Can I Sign up to the Hotel System 14-Day Free Trial? Complete the form below, or initiate a chat in the bottom left hand corner of our webpage. 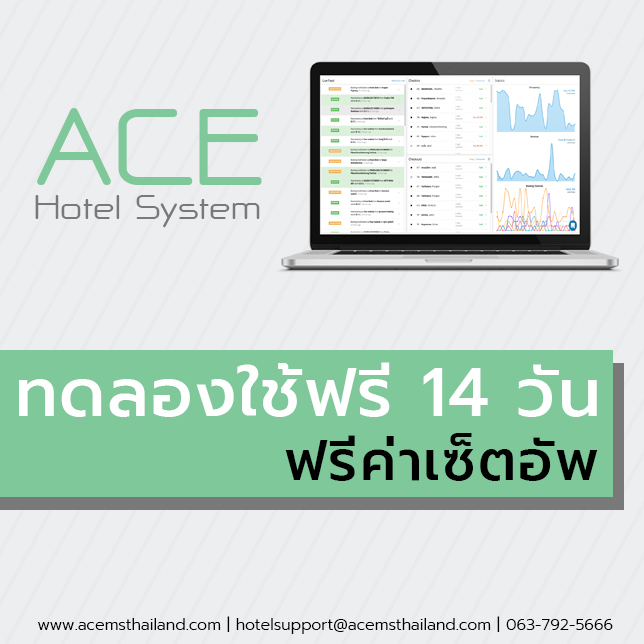 You can also send us an email at hotelsupport@acemsthailand.com. A member of our team will shortly be in touch to initiate the setup.